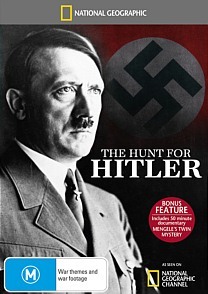 The Hunt for Hitler DVD Review The Hunt for Hitler provides a thoughtful and illuminating introduction to the subject of Hitler’s final days and ultimate resting place. One of the more enduring mysteries haunting the aftermath of World War II was exactly what had become of Adolf Hitler. Spuriously reported by the Nazi press to have died fighting the Russians in Berlin, the city’s capture seemingly produced neither a body nor any hint as to Hitler’s whereabouts. Rumours that he had absconded on a U-Boat bound for Argentina persisted for several years, and the Allies and Russians each accused each other of possessing the dictator’s corpse. This latter charge so infuriated the British that they demanded an immediate investigation into the matter, yet Stalin stymied proceedings by refusing British agents the chance to interview the first Soviet troops to arrive at Hitler’s bunker on 2 May 1945. With good reason: the Russians had had Hitler’s corpse all along. Reportedly the charred remains were interred in a wooden crate for several decades, before being cremated and scattered in the Biederitz river in 1970. A subsequent search of the artillery crater in which Hitler was supposedly buried revealed part of his skull and fragments of his teeth, fragments which presently reside in the Russian state archives. According to historians such as Beevor and Montefiore, Stalin enjoyed taunting his associates in the last years of his life by asking them what they thought had happened to Hitler’s remains, and slyly feigned ignorance when asked point blank about the matter by Churchill at the war’s end. The Hunt for Hitler provides a thoughtful and illuminating introduction to the subject of Hitler’s final days and ultimate resting place. His dental records are compared with the teeth and bridgework in Russian possession in an attempt to conclusively prove their authenticity, the skull fragments are examined anew, several eyewitness accounts provide further testimony as to the storage and multiple reburials of the fascist leader’s remains in the years leading up to 1970, and a wealth of frequently rare period photographs round out the presentation. As appears to be National Geographic’s wont, the disc’s main feature has also been supplemented by a bonus hour-long documentary. In this case we have Mengele’s Twin Mystery, an exploration of the maniacal Nazi doctor’s final decades in South America and his purported role in the curious preponderance of twins inhabiting the obscure Brazilian town of Cândido Godói. A comprehensive investigation undertaken by the Brazilian government in 2009 put paid to any role Mengele might have played in the anomaly – the high rate of twins predates his alleged arrival in the region in 1963 by several decades, and the trend apparently continues to this day – but as far as cranky conspiracy theories go it’s enacted enjoyably enough and the production values and attention to detail are tight. It almost seems plausible... almost.